First Swedish astronaut. Most demanding ISS assembly mission to date. Completed installation of the P5 truss, retracted the recalcitrant port P6 solar array wing, and activated the truss electrical and cooling system. AKA: Discovery;ISS-12A.1;Spacehab Logistics Module. Launched: 2006-12-10. Returned: 2006-12-22. Number crew: 6 . Duration: 12.86 days. The flight was originally scheduled for July 2003 but was delayed after the Columbia disaster. In comparison with the original crew, Polansky replaced Wilcutt as commander, and Patrick was added. The original flight was to change out a complete three-member ISS crew. By 2006 the core two-member ISS crew was maintained at the station by the more reliable Soyuz. Instead, the only a third ISS crew member - Williams was brought up by STS-116 and exchanged for German astronaut Reiter. Bay 5P: APC with SPDU - 20 kg? The STS-116 mission to the International Space Station was the most complex of the shuttle assembly flights. Seven shuttle astronauts and three station astronauts worked closely with flight to reconfigure the station's electrical power and cooling systems. The station had been running on a temporary electrical system since 1998. The new, permanent configuration incorporated power from the P4 solar arrays that were installed during STS-115. Discovery also delivered and installed the 1820-kg P5 truss element that extended the left side of the overall truss, allowing the P4 solar panels to rotate and it set the stage for the relocation of the P6 solar arrays on a later assembly flight. STS-116 astronaut Sunita Williams was left on the station with the EO-14 long duration crew, while ESA Flight Engineer Thomas Reiter, already aboard the station, was returned to earth. Problems with retraction of the P6 array resulted in the addition of an additional spacewalk and extended the mission by one day over the planned 12 days. EVA 1: On flight day 4, Curbeam and Fuglesang aligned and connected the P5 truss segment to P4. However problems were experienced in retraction of the P6 solar array. It could not be fully retracted, although enough was folded up to allow the P4 arrays to rotate freely when relocated. EVA 2: On flight day 6, Curbeam and Fuglesang reconfigured power on channels 2 and 3 of the station's electrical system. The feared partial shutdown of the ISS power systems and power-up from the new P4 solar array was conducted without a hitch. EVA 3: On flight day 8, Curbeam and Williams reconfigured power on channels 1 and 4 of the station's electrical system. 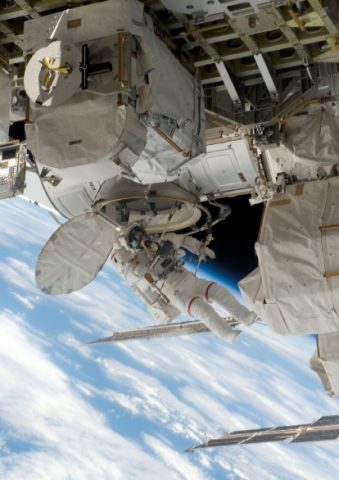 The partial shutdown of the ISS power systems and power-up from the new P4 solar array was conducted without a hitch. They also moved Zvezda module debris protection panels to a storage location on the station exterior and performed other small tasks. EVA 4: On flight day 10, Curbeam and Fuglesang conducted an unscheduled spacewalk, and successfully managed to fully retract the P6 solar array. P5 truss delivery - The shuttle robotic arm transferred the P5 to the station's robotic arm which then placed the component on the truss. Spacehab cargo delivery - The pressurized module contained 2600 kg of cargo which the crew transferred to the station. A gyroscope on the Treadmill Vibration Isolation System was repaired during the second spacewalk. During the third spacewalk, a newly-designed component was installed in the station's Carbon Dioxide Removal Assembly. On flight day 12, two microsatellites were launched from Discovery's cargo bay that would measure the density and composition of the low Earth orbit atmosphere. First test of a space shuttle main engine with the Advanced Health Monitoring System installed. The system monitored the flow of fuel within the high-pressure fuel pumps of the main engine in monitor-only mode. On future missions the system would be activated, allowing it to shut down the engine in case problems were detected that indicated imminent engine failure. STS-116 was the 117th space shuttle flight, the 33rd flight for shuttle Discovery and the 20th flight to the station. It was the 29th nighttime shuttle launch and the first since Endeavour lifted off on STS-113 in 2002. During an average day on the station, flight controllers gave approximately 800 commands. During the highly-choreographed power transfer portion of this mission, on flight days 6-8, controllers gave about 4,500 commands. Ground teams had trained for six years to ensure the mission timeline was as efficient and safe as possible. As of STS-116, NASA estimated that 16,000 Americans were working on the Space Shuttle Program. Family: Manned spaceflight. People: Curbeam, Fuglesang, Higginbotham, Oefelein, Patrick, Polansky. Country: USA. Spacecraft: Discovery. Launch Sites: Cape Canaveral. Agency: NASA. 2006 December 1 - . 2006 December 9 - . 2006 December 10 - . STS-116 - Wakeup Song: Here Comes the Sun - . Flight: STS-116. "Here Comes the Sun" by the Beatles for Mark Polansky..
2006 December 11 - . STS-116 - Wakeup Song: Beep Beep - . Flight: STS-116. "Beep Beep" " performed by Louis Prima for Sunita Williams..
2006 December 12 - . STS-116 - Wakeup Song: Waterloo - . Flight: STS-116. "Waterloo" � performed by ABBA for Christer Fuglesang who is from Sweden. �Nice music this morning,� Fuglesang said from the Quest airlock, where he spent the night preparing for the spacewalk with Curbeam..
2006 December 13 - . STS-116 - Wakeup Song: Suavemente - . Flight: STS-116. "Suavemente" � performed by Elvis Crespo, played for Joan Higginbotham..
STS-116 MCC Status Report 09 - . Nation: USA. Related Persons: Curbeam, Fuglesang, Lopez-Alegria, Polansky. Program: ISS. Flight: Soyuz TMA-9, STS-116. 2006 December 13 - . 20:31 GMT - . EVA STS-116-1 - . Crew: Curbeam, Fuglesang. EVA Duration: 0.28 days. Nation: USA. Related Persons: Curbeam, Fuglesang. Program: ISS. Flight: Soyuz TMA-9, STS-116. The crew aligned and connected the P5 truss segment to P4. However problems were experienced in retraction of the P6 solar array. It could not be fully retracted, although enough was folded up to allow the P4 arrays to rotate freely when relocated..
2006 December 14 - . STS-116 - Wakeup Song: Under Pressure - . Flight: STS-116. "Under Pressure" � performed by Queen for Robert Curbeam..
2006 December 15 - . STS-116 - Wakeup Song: Low Rider, - . Flight: STS-116. "Low Rider," performed by War, and played for William Oefelein..
2006 December 15 - . 19:41 GMT - . EVA STS-116-2 - . Crew: Curbeam, Fuglesang. EVA Duration: 0.21 days. Nation: USA. Related Persons: Curbeam, Fuglesang. Program: ISS. Flight: Soyuz TMA-9, STS-116. The crew reconfigured power on channels 2 and 3 of the station's electrical system. The feared partial shutdown of the ISS power systems and power-up from the new P4 solar array was conducted without a hitch..
2006 December 16 - . STS-116 MCC Status Report 15 - . Nation: USA. Related Persons: Curbeam, Fuglesang, Williams. Program: ISS. Flight: Soyuz TMA-9, STS-116. STS-116 - Wakeup Song: Fanfare for the Common Man - . Flight: STS-116. "Fanfare for the Common Man" � performed by the London Philharmonic Orchestra. The music was played for Nicholas Patrick..
2006 December 17 - . STS-116 MCC Status Report 17 - . Nation: USA. Related Persons: Curbeam, Fuglesang, Higginbotham, Oefelein, Patrick, Polansky, Williams. Program: ISS. Flight: Soyuz TMA-9, STS-116. STS-116 - Wakeup Song: Blue Danube - . Flight: STS-116. "Blue Danube" ue Danube" performed by the Vienna Philharmonic Orchestra for Christer Fuglesang..
2006 December 17 - . 19:25 GMT - . EVA STS-116-3 - . Crew: Curbeam, Williams. EVA Duration: 0.31 days. Nation: USA. Related Persons: Curbeam, Williams. Program: ISS. Flight: Soyuz TMA-9, STS-116. The crew reconfigured power on channels 1 and 4 of the station's electrical system. The partial shutdown of the ISS power systems and power-up from the new P4 solar array was conducted without a hitch. They also moved Zvezda module debris protection panels to a storage location on the station exterior and performed other small tasks. 2006 December 18 - . STS-116 - Wakeup Song: Good Vibrations - . Flight: STS-116. "Good Vibrations" � performed by the Beach Boys for the entire crew in honor of the vibrations the spacewalkers may create today to attempt to free the balky solar panels..
2006 December 19 - . STS-116 - Wakeup Song: The Zamboni Song - . Flight: STS-116. "The Zamboni Song" � performed by the Gear Daddies. The song, dedicated to the entire crew, was requested by the training team who sent a message to Oefelein saying they had arranged for him to fly the shuttle half a lap around the station..
2006 December 19 - . 19:00 GMT - . EVA STS-116-4 - . Crew: Curbeam, Fuglesang. EVA Duration: 0.28 days. Nation: USA. Related Persons: Curbeam, Fuglesang. Program: ISS. Flight: Soyuz TMA-9, STS-116. The crew conducted an unscheduled spacewalk, and successfully managed to fully retract the P6 solar array..
2006 December 20 - . STS-116 - Wakeup Song: Say You'll be Mine - . Flight: STS-116. "Say You'll be Mine" � performed by Christopher Cross for Thomas Reiter..
2006 December 21 - . STS-116 - Wakeup Song: The Road Less Traveled, - . Flight: STS-116. "The Road Less Traveled," performed by Joe Sample for Higginbotham..
2006 December 22 - . STS-116 - Wakeup Song: Home For the Holidays - . Flight: STS-116. "Home For the Holidays" � sung by Perry Como for the crew, requested by the Mission Control Center..
2006 December 22 - . 22:32 GMT - . Landing of STS-116 - . Return Crew: Curbeam, Fuglesang, Higginbotham, Oefelein, Patrick, Polansky, Reiter. Nation: USA. Related Persons: Curbeam, Fuglesang, Higginbotham, Oefelein, Patrick, Polansky, Reiter. Program: ISS. Flight: STS-116, STS-121 Astrolab.